For most of us, our families make our lives -- and life in retirement -- richer and far more enjoyable. However, retirement planning has traditionally centered on just dollars and cents -- and largely on the financial needs of an individual or a couple. With more and more of our lives impacted by family ties as well as family tensions, perhaps it's time to rethink retirement planning from a more holistic perspective. Parenthood Doesn't Retire. In today's uncertain economy, many adult children and grandchildren are struggling with stalled careers and financial difficulties. As a result, they increasingly "boomerang," returning to parents and grandparents for a helping hand. Extended Lives, Extended Needs. At the same time, our parents are living longer than any generation in history and very often require emotional, physical and financial support for years--and sometimes for decades. Stretched and Stressed. Far too many pre-retirees and retirees have insufficient savings, putting them on shaky ground as they attempt to balance the trade-offs of their own financial security with the well-being of their kids, parents and siblings. To better understand how our families impact our retirement plans, my firm, Age Wave, in partnership with Merrill Lynch, just completed a large, groundbreaking survey entitled "Family & Retirement: The Elephant in the Room." Conducted by research firm Harris Interactive, the survey gathered responses from a representative sample of more than 5,000 people age 25 and older from all walks of life (including thousands of pre-retirees as well as retirees), who weighed in with their hopes and fears about retirement. This landmark study goes far beyond any examination on this topic to date and reveals the impact that today's complex family interdependencies have on retirement. In this two-part Huffington Post series (beginning today and concluding tomorrow), I will present key findings from this study and explore how you might best prepare and, if needed, course-correct to optimize your retirement success. You can download the entire report at www.ml.com/retirementstudy. 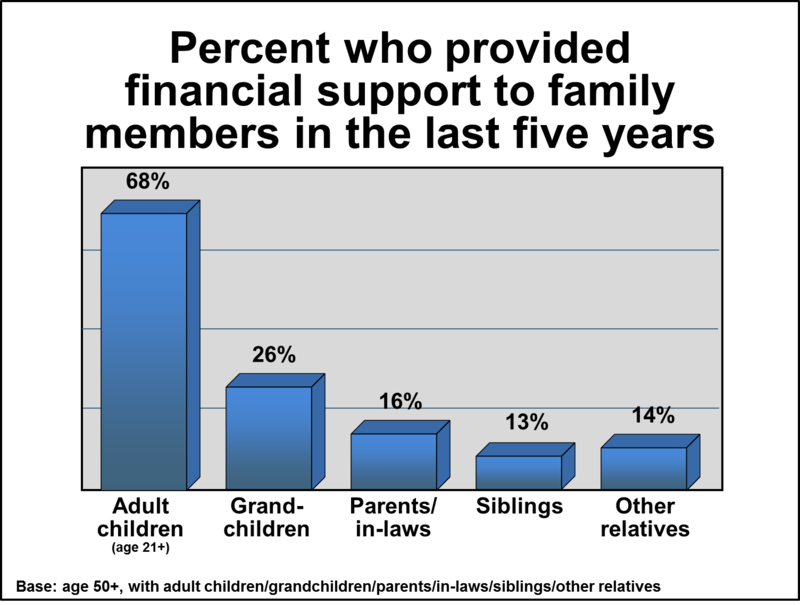 We were somewhat startled to discover that six in ten people (62%) age 50+ today are providing financial support to adult family members. This support may be in response to a one-time need, or it could take the form of ongoing assistance over many years. Tens of millions of boomers are regularly subsidizing their adult children's rent or mortgage payments, insurance, cell-phone bills, car purchases or leases, and tuition expenses. And this assistance is often offered without expecting very much in return. "I'm not looking to get back the money I loaned my daughter," said a focus group participant. "I'm just happy I could help her when she needed it." But those providing support to family members often haven't included these short- or long-term costs in their own retirement planning. "Given the challenging economic climate during the past several years, it is not surprising that so many Americans have extended financial support to their loved ones," reflects Andy Sieg, head of Global Wealth and Retirement Solutions for Bank of America Merrill Lynch. "However, such admirable willingness to assist family members should not place the financial security of men and women entering or in retirement in jeopardy." 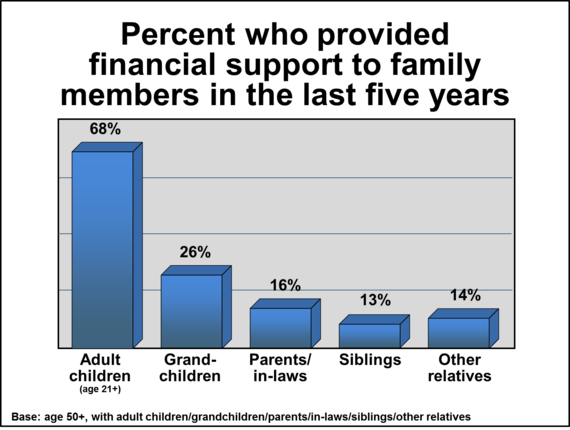 Family financial help now extends in multiple directions, including to adult children, grandchildren, parents/in-laws, and siblings (see FIGURE 1). The amount of this support can be substantial. In fact, it averaged a total of $9,200 over the past five years among people with less than $250,000 in investable assets, and a whopping $19,100 over the past five years for people with between $250,000 and $500,000 in investable assets. And among the very wealthy (those with more than $5,000,000 in investable assets), the average five-year family outlay was $313,000! With all the talk about the baby boomers being the "me" generation, I was heartened to see that our study revealed an enormously high level of selfless generosity among them when it comes to helping out their younger and elder loved ones. More and more people are cutting back on some of their own comforts to help family members in need, whether it's downsizing a home to have the resources to help fund a grandchild's college education or buying a less-expensive car to help out a parent in a period of distress. 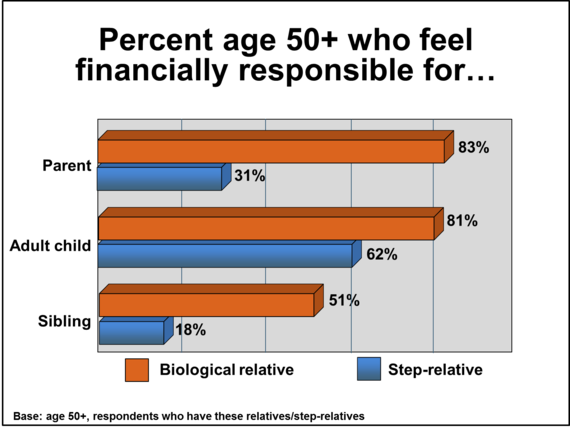 Three out of five people (56%) age 50+ now consider a member of their family to be the "family bank," meaning someone who their family is most likely to turn to for financial help. And as you might expect, the more financially responsible and successful you are, the more likely you will be considered the family bank. As one of our focus group participants commented: "I thought I would be supplementing my grandchildren's college funds. It turns out, I was the college fund." According to the study, half of pre-retirees say they would even make major lifestyle sacrifices to help their family members. These include retiring later, returning to work after retirement, and accepting a less comfortable retirement lifestyle to help family. It turns out that those lending a hand to family members rarely do so because they expect future help or financial payback. 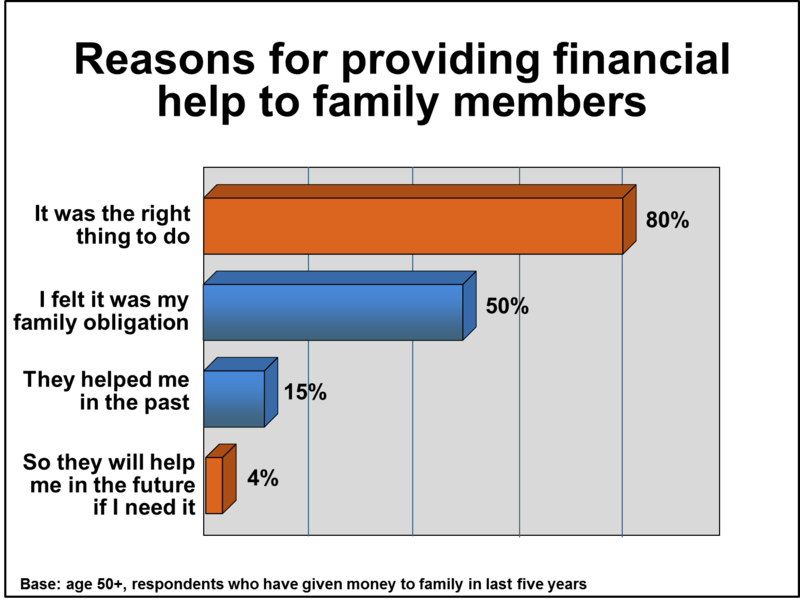 Older adults are 20 times more likely to say they are helping family because "it is the right thing to do" than because "family members will help me in the future (see FIGURE 2). This willingness to trim back on personal comforts to lend a helping hand to loved ones also extends to a huge shift in mindset regarding inheritance. Three in five people (60%) age 50+ now say it is better to begin to pass on their assets now--when family members might be in need--rather than to wait until the end of their life. Historically, divorce has been the province of the young, but that is changing. It is now increasingly common among older adults, who may feel dissatisfied in their relationship and believe that there are decades in front of them to enjoy, perhaps with a new love. Overall, the percentage of people who divorced per year in the U.S. among all ages remained steady between 1990 and 2010. However, during this time period, the divorce rate among those age 50+ doubled. Margaret Meade, the great anthropologist, once mused, "I've been married three times...all successful!" However, regardless of the fact that "serial monogamy" seems to be the new norm in this longer-lived era, divorce can significantly impact retirement savings and plans. After a divorce, household income drops by more than 40% for women and by about 25% for men. Another interesting dynamic is that roughly three-quarters of people who divorce remarry, multiplying the number of stepchildren, stepparents and stepsiblings in the average family. In fact, nearly two in five people age 50+ are now part of a blended family. 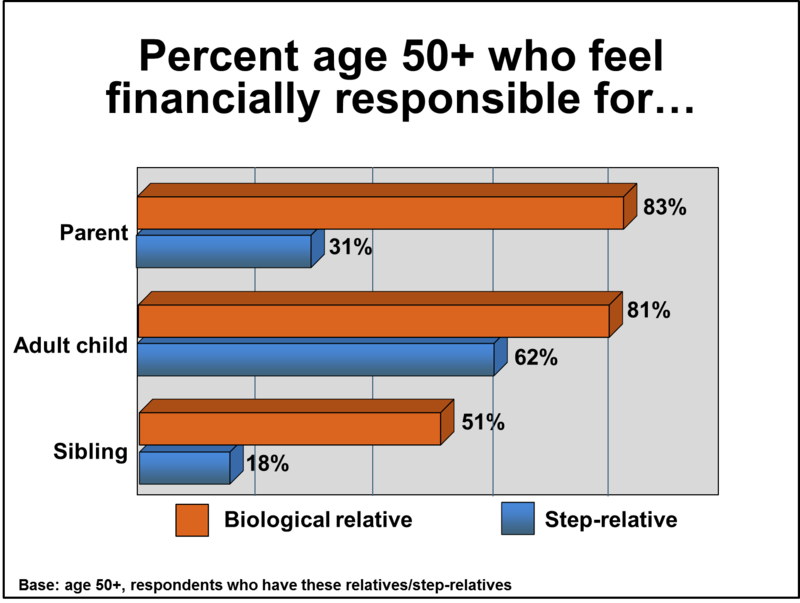 Our study revealed that while adults age 50+ generally feel some financial responsibility for stepfamily members (most particularly stepchildren), it's usually less responsibility than they feel for biological relatives (see FIGURE 3). There is no question that families are a major source of fulfillment during our retirement years--but our families can also create unforeseen financial challenges. Too often, people plan for their retirement without factoring in how they might be called upon to help out their adult children, aging parents and siblings. In this new era of extended longevity and increased family interdependencies, retirement planning is no longer about just an individual or a couple, but also about the needs and hopes of all our loved ones. Stay tuned. In tomorrow's blog, I will share results regarding retirement's unexpected family worries and why, when it comes to family retirement planning, silence isn't golden. I will also offer tips for how to balance your family's needs with your own retirement dreams. I'd like to know what you think. Should we help out our children and parents, even if it means putting our own financial security on shakier ground? What's the best way to draw boundaries to make this all work out? Are there any things you've done to sort these issues out within your own family? "Have Kids And Aging Parents? How To Keep On Track For Your Retirement," by Ritika Pui. Forbes (2013). Available at http://www.forbes.com/sites/northwesternmutual/2013/04/30/how-the-sandwich-generation-can-help-their-families-without-hurting-their-retirement. "Caught in the Sandwich Generation? How to Save Your Retirement Funds," by Andrea Murad. FoxBusiness.com (2013). Available at http://www.foxbusiness.com/personal-finance/2013/04/29/caught-in-sandwich-generation-how-to-save-your-retirement-funds. "From Parents, a Living Inheritance," by Ron Lieber. The New York Times (2012). Available at http://www.nytimes.com/2012/09/22/your-money/the-hidden-inheritance-many-parents-already-provide.html. "6 Ways To Give Family And Friends Financial Aid," by Deborah L. Jacobs. Forbes (2011). Available at http://www.forbes.com/sites/deborahljacobs/2011/08/22/6-ways-to-give-family-and-friends-financial-aid. Kelley Hawkins (left) smiles with her grandmother AnnaBelle Bowers, 87, while at lunch in Harrisburg, Pa. Hawkins shares full-time care of Bowers with her sister-in-law LaDonna Martin. Both are nurses with two children each, and move Bowers, who has limited mobility, every two weeks from one home to another.